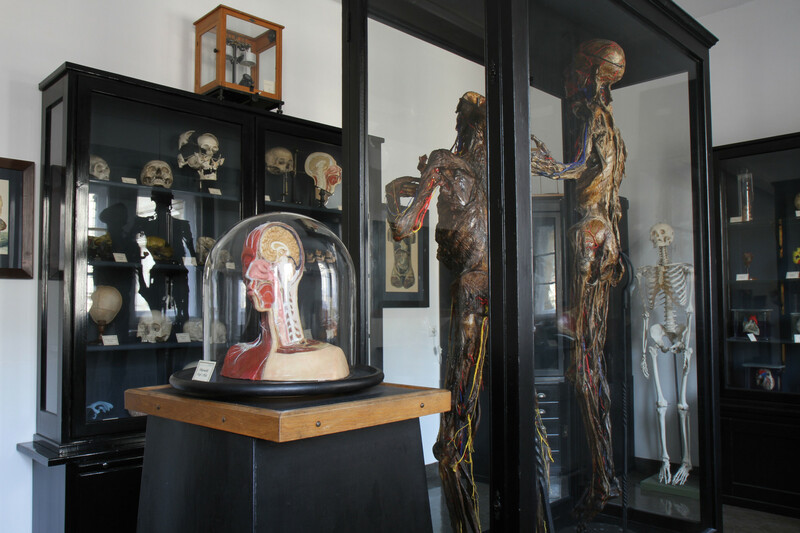 The Anatomical Collection is almost as old as the University itself. The first anatomical dissection took place just a few weeks after the foundation of the University in Erlangen in November 1743. One of the purposes of the dissections was to create preparations for use in teaching. These preparations formed the core part of the Anatomical Collection. The dissections were originally public and it was not until 1850 that the general public were kept out of the dissection room. However, the collection remained open to everybody and it became a tradition to visit it during the week of Pentecost. This tradition was continued until the 1970s. Since the mid-1990s, the Anatomical Collection has been open to members of the public as part of the Collegium Alexandrinum. Today the collection is split over two locations. The Institute of Anatomy I on Krankenhaustraße is home to the historical and topographical preparations, while the Institute of Anatomy II on Universitätsstraße houses the embryological specimens and the pieces used for comparative anatomy. The collection is still used for teaching in medicine. Its wide range of models and wet and dry preparations illustrate the development and structure of the human body.